Make a traditional Seder dish, and then join Middle Eastern chef, author, and culinary instructor Jennifer Abadi (and NYWCA member) for a pre-Passover dinner event featuring Alliance-made dishes from her cookbook,Too Good To Passover: Sephardic and Judeo-Arabic Communities of Africa, Asia and Europe. We will all make one dish for the Seder, then gather at member Jennifer Clair's Soho Home Cooking New York cooking school for a full Seder menu featuring such dishes as Moroccan Date-Raisins “Truffles”; Egyptian Slow Stewed Beef; Gibraltarian Layered Matzah Pie with Ground Beef; Algerian Broiled Pepper Salad; and Italian Almond-Pignoli Macaroons. During the meal, Jennifer will share special stories about Passover from individuals she interviewed for her book, and explain varying Seder plate foods and rituals from the non-Ashkenazic world. All attendees will receive TWO credits for the event. Each attendee will recieve a credit for attending, plus an additional credit to 1) prepare one recipe from Jennifer’s cookbook to share at the dinner; or 2) bring two bottles of wine; or 3) take pictures and write a short report of the evening. After signing up and making your ticket selection, Jennifer will be in contact with you about recipes (or wine suggestions) to choose from. 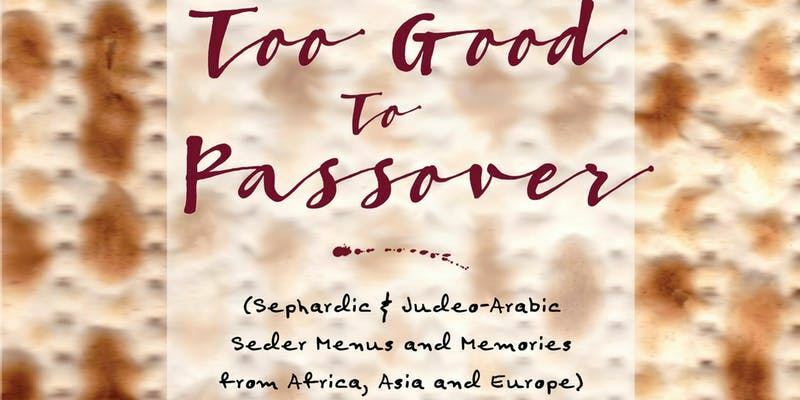 Signed copies of Too Good To Passover will be available for purchase at the event for a discounted member price of $25/each. If you already know that you would like to purchase any copies, please email Jennifer directly ahead of time (Jennifer@JenniferAbadi.com) so that she can be sure to bring enough books. For more information, contact the event organizers: Jennifer Adabi (Jennifer@JenniferAbadi.com) and Jennifer Clair (Jennifer@homecookingny.com).